Talking 'Mad Men' With Creator Matthew Weiner The six-time Emmy winning writer explains how he came up with the idea for the major plot shakeup at the end of the third season and details his favorite moments from the series. 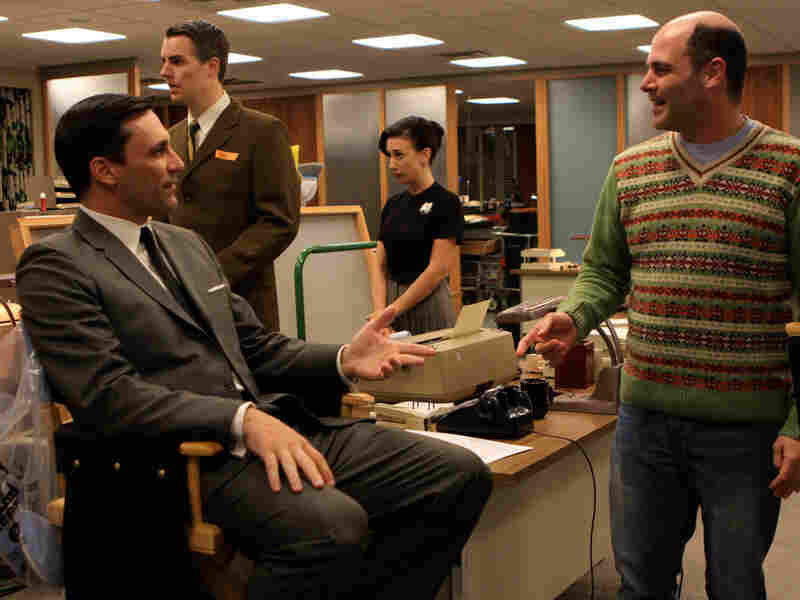 Mad Men creator Matthew Weiner (right) discusses a scene with star Jon Hamm during the taping of the AMC drama. The the third season of the AMC drama Mad Men ended in a spectacularly big way. Not only did protagonist Don Draper and some of his coworkers leave the advertising firm Sterling Cooper to form a new agency -- Sterling Cooper Draper Pryce -- but Don's marriage to his wife Betty exploded after Don revealed that he isn't who he said he was all along. Series creator Matthew Weiner tells Fresh Air's Terry Gross that he always intended to shake up Mad Men's plot -- and in a big way. "From the beginning of the season last year, I said, 'This year is really going to be about change.'" he says. "And I really felt, story-wise, well, this marriage is the crux of the series, and Don had this secret that he was keeping from everyone, including his wife -- and that needed to come out." On today's Fresh Air, Weiner explains how he came up with the idea for the major plot shakeup and details his favorite moments from the series. Weiner -- who is also Mad Men's head writer and an executive producer -- was previously a writer for The Sopranos. He has received six Emmy Awards for his work on the two series. "It was really hard. It was really hard to make just a change. I remember shooting the last scene [of season three's finale], which was between Peggy and Don, the way the schedule worked. And it was in his office, and I pulled [Elizabeth Moss, who plays Peggy Olsen] aside afterward, and I said 'What am I doing?' I was a little emotional; I said, 'This set is, probably more than I know, the secret of success of the show.' ... And she said 'You won't be sorry. You need a new challenge.'" 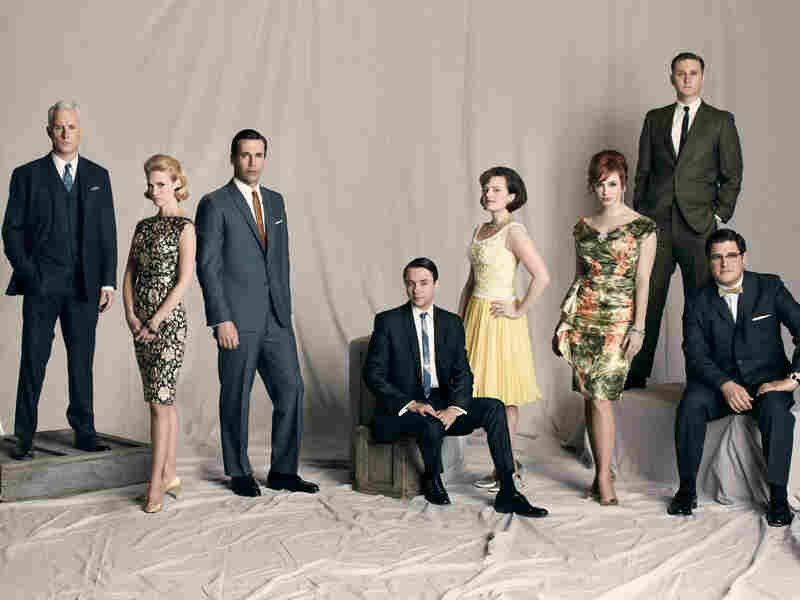 Mad Men's ensemble cast returned for a fourth season on Sunday, July 25. The series has won three consecutive Golden Globes and back-to-back Emmys for the Outstanding Drama Series. "Throughout the seasons, we've seen him come closer and closer to being that idealized man in the suit, with the house in Westchester and the beautiful wife and the two kids and some fame. But it always felt to me that it couldn't be front and center because he has this secret identity. How much fame could he really get? What is his ambition? So now we're at a point in the show where, if he goes out on his own, he is the star of the business -- and he has to go out and basically claim this success." "Part of the inspiration for this character [Don Draper] is based on personalities like Marilyn Monroe. It's hard to identify Don Draper with Marilyn Monroe, but this idea of a false self -- of creating a persona that is so different from where you came from ... there can be a sense of shame, of 'You don't know me. You will never know me. I'm a fraud.' And that's the part that I think the audience can engage with." "I lived in Baltimore, Md., until I was 11 years old, and [things there stayed] basically the way it was in 1960 or 1959, until 1980. The world never catches up to some places. ... I've always walked into the Draper bedroom -- the set -- and we have the furniture there and the pictures on the walls, and it smells to me like my grandmother's apartment."